Jefferson Co. E-911 is please to announce the plans/schedule for National Public Safety Telecommunicators Week. You may dress in costume for theme days; please use discretion and keep in mind that even in costume, you are representing Jefferson Co. E911. This means no exposed midriffs, no visible undergarments, etc… Have fun with the theme but remain professional. If you come in costume, you will get a special raffle ticket. At the end of the week, a drawing will be held for a special prize, a one night stay at a local hotel. When in doubt about whether a given employee is “dressed to the theme”, the supervisor on duty will have the final judgment. Each Telecommunicator’s name will be entered in a raffle. Items have been donated by various business and others who support what you do. Remember these gifts have been donated to Jefferson Co. E-911 to help thank everyone for the job they do, so these are as such gifts and are not to be sold. If you receive a gift that you will not use think about those you work with and give back to one of them. Granted, this is just one week when we pull out all the stops and celebrate the important work you do. We want it to be fun, but not crazy out of control. We will follow-up after the celebration week to see what worked and what didn’t. What you liked and what you didn’t. What suggestions you have for next year. SPECIAL THANKS to everyone for the hard work they do. 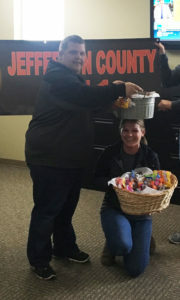 Pictures are of two baskets made for all the employees by Melissa Murray Operation Manager and Autumn Cain QA Supervisor.